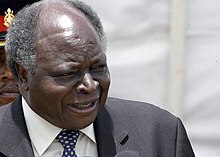 Mwai Kibaki, C.G.H. (born 15 November 1931) is a Kenyan politician who was the third President of Kenya, serving from December 2002 until April 2013. Kibaki was previously Vice-President of Kenya for ten years from 1978 to 1988 under President Daniel arap Moi. He also held cabinet ministerial positions in the Kenyatta and Moi governments, including time as minister for Finance (1969–1981) under Kenyatta, and Minister for Home Affairs (1982–1988) and Minister for Health (1988–1991) under Moi. Kibaki served as an opposition Member of Parliament from 1992 to 2002. He unsuccessfully stood as a presidential candidate in 1992 and 1997. He served as the Leader of the Official Opposition in Parliament from 1998 to 2002. In the 2002 presidential election, he was elected as President of Kenya. Kibaki was born in 1931 in Thunguri village, Othaya division of Kenya's then Nyeri District, now Nyeri County. He is the youngest son of Kikuyu peasants Kibaki Gĩthĩnji and Teresia Wanjikũ. Though baptised as Emilio Stanley by Italian missionaries in his youth, he has been known as Mwai Kibaki throughout his public life. Family oral history maintains that his early education was made possible by his much older brother-in-law, Paul Muruthi, who insisted that young Mwai should go to school instead of spending his days grazing his father's sheep and cattle and baby-sitting his little nephews and nieces for his older sister. Kibaki turned out to be an exemplary student. He attended Gatuyainĩ School for the first two years, where he completed what was then called Sub "A" and sub "B" (the equivalent of standard one and two or first and second grade). He later joined Karima mission school for the three more classes of primary school. He later moved to Mathari School (now Nyeri High School) between 1944 and 1946 for Standard four to six, where, in addition to his academic studies, he learnt carpentry and masonry as students would repair furniture and provide material for maintaining the school's buildings. He also grew his own food as all students in the school were expected to do, and earned extra money during the school holidays by working as a conductor on buses operated by the defunct Othaya African Bus Union. After Karima Primary and Nyeri Boarding primary schools, he proceeded to Mang'u High School where he studied between 1947 and 1950. He passed with a maximum of six points in his "O" level examination by passing six subjects with Grade 1 Distinction. Influenced by the veterans of the First and Second World Wars in his native village, Kibaki considered becoming a soldier in his final year in Mang'u. However, a ruling by the Chief colonial secretary, Walter Coutts, which barred the recruitment of the Kikuyu, Embu and Meru communities into the army, put paid to his military aspirations. Kibaki instead attended Makerere University in Kampala, Uganda, where he studied Economics, History and Political Science, and graduated best in his class in 1955 with a First Class Honours Degree (BA) in Economics. After his graduation, Kibaki took up an appointment as Assistant Sales Manager Shell Company of East Africa, Uganda Division. During the same year, he earned a scholarship entitling him to postgraduate studies in any British University. He consequently enrolled at the prestigious London School of Economics for a B.Sc. in public finance, graduating with a distinction. He went back to Makerere in 1958 where he taught as an Assistant Lecturer in the economics department until 1961. In 1961, Kibaki married Lucy Muthoni, the daughter of a church minister, who was then a secondary school head teacher. In early 1960, Mwai Kibaki left academia for active politics by giving up his job at Makerere and returning to Kenya to become an executive officer of Kenya African National Union (KANU), at the request of Jaramogi Oginga Odinga (who went on to become Kenya's first Vice President). Kibaki then helped to draft Kenya's independence constitution. In 1963, Kibaki was elected as Member of Parliament for Donholm Constituency (subsequently called Bahati and now known as Makadara) in Nairobi. His election was the start of a long political career. In 1963 Kibaki was appointed the Permanent Secretary for the Treasury. Appointed Assistant Minister of Finance and chairman of the Economic Planning Commission in 1963, he was promoted to Minister of Commerce and Industry in 1966. In 1969, he became Minister of Finance and Economic Planning where he served until 1982. In 1974, Kibaki, facing serious competition for his Donholm Constituency seat from a Mrs. Jael Mbogo, whom he had only narrowly and controversially beaten for the seat in the 1969 elections, moved his political base from Nairobi to his rural home, Othaya, where he was subsequently elected as Member of Parliament. The same year Time magazine rated him among the top 100 people in the world who had the potential to lead. He has been re-elected Member of Parliament for Othaya in the subsequent elections of 1979, 1983, 1988, 1992, 1997, 2002 and 2007. When Daniel arap Moi succeeded Jomo Kenyatta as President of Kenya in 1978, Kibaki was elevated to Vice Presidency, and kept the Finance portfolio until Moi changed his ministerial portfolio from Finance to Home Affairs in 1982. When Kibaki was the minister of Finance Kenya enjoyed a period of relative prosperity, fueled by a commodities boom, especially coffee, with remarkable fiscal discipline and sound monetary policies. Kibaki fell out of favor with President Moi in March 1988, and was dropped as Vice President and moved to the Ministry of Health. He seemingly took the demotion in his stride without much ado. Kibaki's political style during these years was described as gentlemanly and non-confrontational. This style exposed him to criticism that he was a spineless, or even cowardly, politician who never took a stand: according to one joke, "He never saw a fence he didn't sit on". He also, as the political circumstances of the time dictated, projected himself as a loyal stalwart of the ruling single party, KANU. In the months before multi-party politics were introduced in 1992, he infamously declared that agitating for multi-party democracy and trying to dislodge KANU from power was like "trying to cut down a fig tree with a razor blade". It was therefore with great surprise that the country received the news of Kibaki's resignation from government and leaving KANU on Christmas Day in December 1991, only days after the repeal of Section 2A of the Constitution, which restored the multi-party system of government. Soon after his resignation, Kibaki founded the Democratic Party (DP) and entered the presidential race in the upcoming multi-party elections of 1992. He was criticized as a "johnny come lately" opportunist who, unlike his two main opposition presidential election opponents in that year, Kenneth Matiba and Jaramogi Oginga Odinga, was taking advantage of multiparty despite not having fought for it. Kibaki came third in the subsequent presidential elections of 1992, when the divided opposition lost to president Moi and KANU despite having received more than two thirds of the vote. He then came second to Moi in the 1997 elections, when again, Moi beat a divided opposition to retain the presidency. In January 1998, Kibaki became the leader of the official opposition with the Democratic Party being the official opposition party in Parliament. In preparation for the 2002 elections, Kibaki's Democratic Party affiliated with several other opposition parties to form National Alliance Party of Kenya (NAK). A group of disappointed KANU presidential aspirants then quit KANU in protest after being overlooked by outgoing President Moi when Moi had founding Father Jomo Kenyatta's son, Uhuru Kenyatta (now Kibaki's successor as Kenya's 4th President after the 2013 General Election), nominated to be the KANU presidential candidate, and hurriedly formed the Liberal Democratic Party (LDP). NAK later combined with the LDP to form the National Rainbow Coalition (NARC). On 14 October 2002, at a large opposition rally in Uhuru Park, Nairobi, Kibaki was nominated the NARC opposition alliance presidential candidate after Raila Odinga made the famous declaration, Kibaki Tosha! On 3 December 2002, Kibaki was injured in a road accident while on his way back to Nairobi from a campaign meeting at Machakos junction 40 kilometres (25 miles) From Nairobi. He was subsequently hospitalized in Nairobi, then London, after sustaining fracture injuries in the accident. He still walks rather awkwardly as a result of those injuries. The rest of his presidential campaign was thus conducted by his NARC colleagues in his absence, led by Raila Odinga and Kijana Wamalwa (who went on to become the Vice President) who campaigned tirelessly for Kibaki after stating, "The captain has been injured in the field... but the rest of the team shall continue." On 27 December 2002, Kibaki and NARC won a landslide victory over KANU, with Kibaki getting 62% of the votes in the presidential elections, against only 31% for the KANU candidate Uhuru Kenyatta. On 29 December 2002, still nursing injuries from the motor vehicle accident and in a wheel chair, Mwai Kibaki was sworn-in as the third President and Commander in Chief of the Armed Forces of the Republic of Kenya. At his inauguration, he stressed his opposition to government corruption, saying: "Government will no longer be run on the whims of individuals." Thus ended four decades of KANU rule, KANU having hitherto ruled Kenya since independence. Kenya's 2nd President, Daniel Arap Moi, who had been in power for 24 years since 1978 as an African Big man President, also began his retirement. President Kibaki's style was that of a low key publicity averse but highly intelligent and competent technocrat. He, unlike his predecessors, never tried to establish a personality cult; never had his portrait on every unit of Kenya's currency; never had all manner of streets, places and institutions named after him; never had state sanctioned praise songs composed in his honor; never dominated news bulletins with reports of his presidential activities - however routine or mundane; and never engaged in the populist sloganeering of his predecessors. His style of leadership has given him the image of a seemingly aloof, withdrawn technocrat or intellectual and has made him seem out of touch with the street, and his seemingly hands-off leadership-by-delegation style made his governments, especially at cabinet level, seem dysfunctional. It is widely acknowledged that age and the 2002 accident denied the country the witty, sporty, eloquent Kibaki of the previous years. A man who could make lengthy and flowery contributions on the floor of Parliament without notes was confined to reading speeches at every forum. In late January 2003, it was announced that the President had been admitted to Nairobi Hospital to have a blood clot – the after-effect of his car accident – removed from his leg. He came out of hospital and addressed the public outside the hospital on TV in a visibly incoherent manner, and speculation since then is that he had suffered a stroke, his second, the first being said to have occurred sometimes in the 1970s. His subsequent ill health greatly diminished his performance during his first term and the affairs of government during that time are said to have been largely run by a group of loyal aides, both in and out of government. Kibaki did not look well, for instance, when he appeared live on TV on 25 September 2003 to appoint Moody Awori Vice President after the death in office of Vice President, Michael Wamalwa Kijana. In January 2003, Kibaki introduced a free primary education initiative, which brought over 1 million children who would not have been able to afford school the chance to attend. The initiative received positive attention, including praise from Bill Clinton, who would travel to Kenya to meet Kibaki. The 2005 Kenyan constitutional referendum was held on 21 November 2005. The main issue of contention in the Constitution review process was how much power should be vested in the Kenyan Presidency. In previous drafts, those who feared a concentration of power in the president added provisions for European-style power-sharing between a ceremonial President elected via universal suffrage and an executive Prime Minister elected by Parliament. The draft presented by the Attorney General Amos Wako for the referendum retained sweeping powers for the Presidency. Though Kibaki the proposal, some members of his own cabinet, mainly from the LDP wing led by Raila Odinga, allied with the main opposition party KANU to mobilize a powerful NO campaign that resulted in a majority of 58% of voters rejecting the draft. As a consequence of, and immediately after, the referendum loss, on 23 November 2005, Kibaki dismissed his entire cabinet in the middle of his administration's term, with the aim of purging all Raila-allied ministers from the cabinet. About his decision Kibaki said, "Following the results of the Referendum, it has become necessary for me, as the President of the Republic, to re-organize my Government to make it more cohesive and better able to serve the people of Kenya". The only members of the cabinet office to be spared a midterm exit were the Vice President and Minister of Home Affairs, Moody Awori, and the Attorney General whose position is constitutionally protected. A new cabinet of Kibaki loyalists, including MP's from the opposition, termed the Government of National Unity (GNU), was thereafter appointed, but some MP's who were offered ministerial positions declined to take up posts. A report by a Kenyan Commission of Inquiry, the Waki Commission, contextualises some issues. They reported that Kibaki, after agreeing to an informal Memorandum of Understanding (MoU) to create the post of Prime Minister, reneged on this pact after being elected. They cite criticism of Kibaki neglecting his pre-election agreement, leaving the public to identify it as an attempt by the Kibaki Government to "keep power to itself rather than share it." 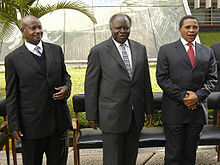 On 26 January 2007, President Kibaki declared his intention of running for re-election in the 2007 presidential election. On 16 September 2007, Kibaki announced that he would stand as the candidate of a new alliance incorporating all the parties who supported his re-election, called the Party of National Unity. The parties in his alliance included the much diminished former ruling KANU, DP, Narc-Kenya, Ford-Kenya, Ford People, and Shirikisho. Kibaki's main opponent, Raila Odinga, had used the referendum victory to launch the ODM, which nominated him as its presidential Candidate for the 2007 elections. On 30 September 2007, a robust and much healthier President Kibaki launched his presidential campaign at Nyayo Stadium, Nairobi. Kalonzo Musyoka then broke away from Raila's ODM to mount his own fringe bid for the presidency, thus narrowing down the contest between the main candidates, Kibaki, the incumbent, and Odinga. Opinion polls up to election day showed Kibaki behind Raila Odinga nationally, but closing. On regional analysis, the polls showed him behind Raila in all regions of the country except Central Province, Embu and Meru, where he was projected to take most of the votes, and behind Kalonzo Musyoka in Kalonzo's native Ukambani. It was thus projected to be a close election between Kibaki and Raila. The election was held on 27 December 2007. Kibaki won and was sworn in what remains to be a contentious issue at twilight. Three days later, after a protracted count which saw presidential results in Kibaki's Central Kenya come in last, allegedly inflated, in a cloud of suspicion and rising tensions, amid vehement protests by Raila's ODM, overnight re-tallying of results and chaotic scenes, all beamed live on TV, at the national tallying center at the Kenyatta International Conference Center in Nairobi, riot police eventually sealed off the tallying Center ahead of the result announcement, evicted party agents, observers and the media, and moved the Chairman of the Electoral Commission, Samuel Kivuitu, to another room where Kivuitu went on to declare Kibaki the winner by 4,584,721 votes to Odinga's 4,352,993, placing Kibaki ahead of Odinga by about 232,000 votes in the hotly contested election with Kalonzo Musyoka a distant third. One hour later, in a hastily convened dusk ceremony, Kibaki was sworn in at the grounds of State House Nairobi for his second term, defiantly calling for the "verdict of the people" to be respected and for "healing and reconciliation" to begin. This arose tension and led to protests by a huge number of Kenyans who felt that Kibaki had refused to respect the verdict of the people and was now forcibly remaining in office. Immediately the results were announced, Odinga bitterly accused Kibaki of electoral fraud. Odinga's allegations scored with his supporters, and seemed meritorious since the results had defied pre-election polls and expectations and election day exit polls. Furthermore, Odinga, who had campaigned against the concentration of political power in the hands of Kikuyu politicians, had won the votes of most of the other Kenyan tribes and regions, with Kibaki's victory being attained only with the near exclusive support of the populous Kikuyu, Meru and Embu communities-who had turned up to vote for Kibaki in large numbers after feeling, in reaction to the Odinga campaign, and with the covert encouragement of the Kibaki campaign, increasingly besieged and threatened by the pro-Odinga tribes. Moreover, ODM had won the most parliamentary and local authority seats by a wide margin. A joint statement by the British Foreign Office and Department for International Development cited "real concerns" over irregularities, while international observers refused to declare the election free and fair. The European Union chief observer, Alexander Graf Lambsdorff, cited one constituency where his monitors saw official results for Kibaki that were 25,000 votes lower than the figure subsequently announced by the Electoral Commission, leading him to doubt the accuracy of the announced results. It was reported that Kibaki, who had previously been perceived as an "old-school gentleman", had "revealed a steely side" when he swore himself in within an hour of being announced the victor of the highly contested election—one where the results were largely in question. Odinga's supporters said he would be declared president at a rival ceremony on Monday, but police banned the event. Koki Muli, the head of local watchdog, the Institute of Education in Democracy, said called the day the "saddest...in the history of democracy in this country" and "a coup d'etat." Opposition supporters saw the result as a plot by Kibaki's Kikuyu tribe, Kenya's largest, to keep power by any means. The tribes that lost the election were upset at the prospect of five years without political power, and anti-Kikuyu sentiment swelled, spawning the 2007–2008 Kenyan crisis, as violence broke out in several places in the country, started by the ODM supporters protesting the "stealing" of their "victory", and subsequently escalating as the targeted Kikuyus retaliated. As unrest spread, television and radio stations were instructed to stop all live broadcasts. There was widespread theft, vandalism, looting and destruction of property, and a significant number of atrocities, killings and sexual violence reported. The violence continued for more than two months, as Kibaki ruled with "half" a cabinet he had appointed, with Odinga and ODM refusing to recognize him as president. When the election was eventually investigated by the Independent Review Commission (IREC) on the 2007 Elections chaired by Justice Johann Kriegler, it was found that there were too many electoral malpractices from several regions perpetrated by all the contesting parties to conclusively establish which candidate won the December 2007 Presidential elections. Such malpractices included widespread bribery, vote buying, intimidation and ballot stuffing by both sides, as well as incompetence from the Electoral Commission of Kenya (ECK), which was shortly thereafter disbanded by the new Parliament. The Country was only saved by the mediation of former United Nations Secretary General Kofi Annan with a Panel of "Eminent African Personalities" backed by the African Union, the United States and the United Kingdom. Following the mediation, a deal, called the national accord, was signed in February 2008 between Raila Odinga and Kibaki, now referred to as the "two Principals". The accord, later passed by the Kenyan Parliament as the National Accord and Reconciliation Act 2008 provided inter alia for power-sharing, with Kibaki remaining President and Raila Odinga taking a newly re-created post of Prime Minister. On 17 April 2008, Raila Odinga was sworn in as Prime Minister, along with a power-sharing Cabinet, with 42 ministers and 50 assistant ministers, Kenya's largest ever. The cabinet was fifty percent Kibaki appointed ministers and fifty percent Raila appointed ministers, and was in reality a carefully balanced ethnic coalition. The arrangement, which also included Kalonzo Musyoka as Vice President, was known as the "Grand Coalition Government". The Kibaki presidency set itself the main task of reviving and turning round country after years of stagnation and economic mismanagement during the Moi years – a feat faced with several challenges, including the aftermath of the Nyayo Era (Moi Presidency), western donor fatigue, the President's ill health during his first term, political tension culminating in the break-up of the NARC coalition, the 2007–2008 post election violence, the 2007–2008 Global Financial crisis, and a tenuous relationship with his coalition partner, Raila Odinga, during his second term. President Kibaki, the economist whose term as Finance minister in the 1970s is widely celebrated as outstanding, did much as President to repair the damage done to the country's economy during the 24-year reign of his predecessor, President Moi. Compared to the Moi years, Kenya was much better managed, by far more competent public sector personnel, and was much transformed. Kenya's economy in the Kibaki years experienced a major turnaround. GDP growth picked up from a low 0.6% (real −1.6%) in 2002 to 3% in 2003, 4.9% in 2004, 5.8% in 2005, 6% in 2006 and 7% 2007, then after the post election chaos and Global Financial Crisis—2008 (1.7%)and 2009 (2.6%), recovered to 5% in 2010 and 5% in 2011. Development was resumed in all areas of the country, including the hitherto neglected and largely undeveloped semi-arid or arid north. Many sectors of the economy recovered from total collapse pre-2003. Numerous state corporations that had collapsed during the Moi years were revived and have begun performing profitably. The telecommunications sector boomed. Rebuilding, modernisation and expansion of infrastructure began in earnest, with several ambitious infrastructural and other projects, such as the Thika Superhighway, which would have been seen as unattainable pipe dreams during the bland and largely stagnant Moi years, completed. The country's cities and towns also began being positively renewed and transformed. The Constituency Development Fund (CDF) was also introduced in 2003. The fund was designed to support constituency-level, grass-root development projects. It was aimed to achieve equitable distribution of development resources across regions and to control imbalances in regional development brought about by partisan politics. It targeted all constituency-level development projects, particularly those aiming to combat poverty at the grassroots. The CDF programme has facilitated the putting up of new water, health and education facilities in all parts of the country including remote areas that were usually overlooked during funds allocation in national budgets. CDF was the first step towards the devolved system of government introduced by the 2010 Constitution, by which Local Government structures were Constitutionally redesigned, enhanced and strengthened. President Kibaki also oversaw the creation of Kenya's Vision 2030, a long term development plan aimed at raising GDP growth to 10% annually and transforming Kenya into a middle income country by 2030, which he unveiled on 30 October 2006. The Kibaki regime also saw a reduction of Kenya's dependence on western donor aid, with the country being increasingly funded by internally generated resources such as increased tax revenue collection. Relations with China, Japan and other non-western powers improved and expanded remarkably in the Kibaki years. China and Japan especially, the Asian Tigers such as Malaysia and Singapore, Brazil, the Middle East and to a lesser extent, South Africa, Libya, other African Countries, and even Iran, became increasingly important economic partners. President Kibaki was accused of ruling with a small group of his elderly peers, mainly from the educated side of the Kikuyu elite that emerged in the Kenyatta era, usually referred to as the "Kitchen Cabinet" or the "Mount Kenya Mafia". There was therefore the perception that his was a Kikuyu presidency. This perception was reinforced when the President was seen to have trashed the pre- 2002 election Memorandum of Understanding with the Raila Odinga-led Liberal Democratic Party, and was further reinforced by his disputed 2007 election victory over the Raila Odinga led ODM Party being achieved nearly exclusively with the votes of the populous Mt. Kenya Kikuyu, Meru and Embu communities. The post election violence [in early 2008]therefore is, in part, a consequence of the failure of President Kibaki and his first Government to exert political control over the country or to maintain sufficient legitimacy as would have allowed a civilised contest with him at the polls to be possible. Kibaki's regime failed to unite the country, and allowed feelings of marginalisation to fester into what became the post election violence. He and his then Government were complacent in the support they considered they would receive in any election from the majority Kikuyu community and failed to heed the views of the legitimate leaders of other communities. Critics posit that President Kibaki failed to take advantage of the 2002 popular mandate for a complete break with the past and fix the politics largely mobilized along ethnic interests. "... when we achieved and the new world dawned, the old men came out again and took our victory to re-make in the likeness of the former world they knew." Elected in 2002 on a reform platform, Kibaki was seen to have re-established the status quo ante. His opponents charged that a major aim of his presidency was the preservation of the privileged position of the elite that emerged during the Kenyatta years, of which he was part. I the sum total, the Kibaki Presidency did not do nearly enough to address the problem of tribalism in Kenya. "Kibaki was, by far, a better manager of the economy than Moi before him. He brought order to the management of public affairs, a departure from the rather informal style that characterised the Moi regime. Kibaki's push for free primary education remains an important achievement, as will the revival of key economic institutions such as the Kenya Meat Commission and the Kenya Cooperative Creameries, ruined during the Moi-era. ... However, Kibaki was not all success. Having come to power in 2003 on an anti-corruption platform, he set up two commissions, the Bosire Commission on the Goldenberg scandal and the Ndung'u Commission, which investigated irregular land allocation. However, the reports were not implemented. Further, the Kibaki administration was rocked by a corruption scandal of its own, the Anglo Leasing scam, involving his close associates. John Githongo, an inspired appointment by Kibaki for an anti-corruption czar, resigned from the government in 2005, citing lack of support from the president. As he leaves office, therefore, the fight against corruption remains unfulfilled. ... But, perhaps, the most controversial aspect of the Kibaki tenure will always be his relationship with senior politicians of his day, particularly Raila Odinga and Kalonzo Musyoka. The context of this complex relationship includes the post-election violence of 2007, whose roots go back to the dishonoured Memorandum of Understanding between Kibaki and Raila in 2002. The quarrel over the MoU directly led to the break-up of the Narc government, after which Kibaki showed Odinga the door and invited the opposition to rule with him. The effect was that the opposition, rejected at the polls, joined government while Raila's faction, validly elected to power, was consigned to the opposition. ... To the supporters of Raila and Kalonzo, Kibaki will be remembered as a person who did not keep political promises." Overall, President Kibaki has been a weak leader who suppressed his conscience to survive dangers of one-party dictatorship. To get along Kibaki has never taken risks of leadership that are associated with leaders like Dedan Kimathi, Jomo Kenyatta, Mahatma Gandhi or Nelson Mandela who sacrificed greatly for the cause of freedom, justice and country. With a dwarfish conscience, Kibaki allowed the man in him to die and never did anything truly memorable ... when Kenyans wanted Kibaki to lead them against the tyranny of Kanu, he turned them down and stuck with dictatorship. Consequently, many Kenyans called him "General Kiguoya" or "General Coward. ... Kibaki's politics was characterised by an attitude of taking extreme caution or "sitting on the fence" over risky questions. He only took sides when the safe side was clear. While some called this cowardice, Kibaki's admirers called it wisdom that won him the highest office in the land winning the favour of whole communities and elites. It remains to be seen whether this "wisdom" will win him lasting legacy as well. In judging his legacy, I will say Kibaki and his ilk committed grave errors that saddled Kenya with her terrible calamities of dictatorship or impunity, poverty and underdevelopment ... in judging Kibaki, posterity will not forget that, when Kenyans were risking jail, detention, exile and even death to end Kanu one party dictatorship, he called every second liberator "mad man of the market that was trying to fell a fig tree with a razor blade. ... Kibaki has been praised as a brilliant economist. But his 'Kibakinomics' have kept Kenya poor and backward when other Third World countries were industrialising and joining the First World. 'Kibakinomics' has given leaders and elites freedom to grab and rob, enriched a few, impoverished millions and has afflicted thousands in his Central province backyard with jiggers. Same 'Kibakinomics' has allowed the country to lose Sh367 billion annually to corruption that has flourished under Kibaki's watch. 'Kibakinomics' even hired Mackinsey Ltd to dream Vision 2030 for Kenya! In the meantime, foreign companies have had a field day minting trillions in Kenya...unbeknown to most people, Kibaki entrenched ethnic rule and encouraged his ministers to turn their ministries into dens of ethnicity. Accordingly, the Kibaki government shared public funds and top jobs ethnically, to communities according to their political loyalty and numerical strength. Those who did not fit into clear ethnic definitions ... were simply left out of the cabinet and other political appointments. Though president Kibaki was never personally accused of corruption, and managed to virtually end the grabbing of public land rampant in the Moi and Kenyatta eras, he was unable to adequately contain Kenya's widely entrenched culture of endemic corruption. "Whether expressed in the petty bribes the average Kenyan had to pay each week to fat-bellied policemen and local councillors, the jobs for the boys doled out by civil servants and politicians on strictly tribal lines, or the massive scams perpetrated by the country's ruling elite, corruption had become endemic. 'Eating', as Kenyans dubbed the gorging on state resources by the well-connected, had crippled the nation. In the corruption indices drawn up by the anti-graft organisation Transparency International, Kenya routinely trail[s] near the bottom ... viewed as only slightly less sleazy than Nigeria or Pakistan ..."
For a leader who was popularly swept into power in 2002 on an anti-corruption platform, Kibaki's tenure saw graft scandals where hundreds of millions of shillings were siphoned from public coffers. Kibaki's National Rainbow Coalition — which took power from the authoritarian rule of Daniel arap Moi—was welcomed for its promises of change and economic growth, but soon showed that it was better suited to treading established paths. The initial response to corruption was very solid ... but it became clear after a while that these scams reached all the way to the president himself," said Kenya's former anti-corruption chief John Githongo in Michela Wrong's book It's Our Turn to Eat. Most notorious of a raft of graft scandals was the multi-billion shilling Anglo Leasing case, which emerged in 2004 and involved public cash being paid to a complicated web of foreign companies for a range of services—including naval ships and passports—that never materialised." However, the passage of Kenya's transformative 2010 Constitution, successfully championed by President Kibaki in the Kenyan constitutional referendum in 2010 was a major triumph and achievement, which went a long way into addressing Kenya's governance and institutional challenges. With the new Constitution started wide-ranging institutional and legislative reforms, which President Kibaki skilfully and successfully steered in the final years of this presidency. "His greatest moment was the promulgation of the new Constitution... It was a very deep and emotional moment for him," Kibaki's son Jimmy was quoted as saying. A proud looking but rather worn President Kibaki handed over the Kenyan presidency to his successor, Uhuru Kenyatta, on 9 April 2013 at a public inauguration ceremony held at Kenya's largest stadium. "I am happy to pass the torch of leadership to the new generation of leaders", said Kibaki. He also thanked his family and all Kenyans for the support they had given him throughout his tenure in office, and cited the various achievements his government made. The handover marked the end of his presidency and of his 50 years of public service. 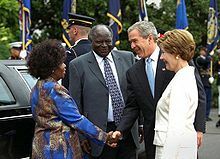 Mwai Kibaki and Mrs. Kibaki with U.S. President George W. Bush and Laura Bush at the White House during a state visit in 2003. President Kibaki was married to Lucy Muthoni from 1961 until her death in 2016. They have four children: Judy Wanjiku, Jimmy Kibaki, David Kagai, and Tony Githinji. They also have four grandchildren: Joy Jamie Marie, Mwai Junior, Krystinaa Muthoni. Jimmy Kibaki did have, so far unsuccessful, designs to be his father's political heir. In 2004, the media reported that Kibaki has a second spouse, whom he allegedly married under customary law, Mary Wambui, and a daughter, Wangui Mwai. State House in response released an unsigned statement that Kibaki's only immediate family at the time was his then wife, Lucy, and their four children. In 2009, Kibaki, with Lucy in close attendance, held an odd press conference to re-state publicly that he only has one wife. The matter of Kibaki's alleged mistress, and his wife's usually dramatic public reactions thereto, provided an embarrassing side-show during his presidency, with the Washington Post terming the entire scandal as a "new Kenyan soap opera". Ms. Wambui, the rather popular "other woman", who enjoyed the state trappings of a Presidential spouse and became a powerful and wealthy business-woman during the Kibaki Presidency, frequently drove Lucy into episodes of highly embarrassing very publicly displayed rage. Ms. Wambui, despite opposition from Kibaki's family, led publicly by Kibaki's son, Jimmy, and despite Kibaki's public endorsement and campaign for her opponent, succeeded Kibaki as Member of Parliament for Othaya in the 2013 General Election. In December 2014, Senator Bonny Khalwale stated on KTN's Jeff Koinange Live that President Kibaki had introduced Wambui as his wife. Kibaki enjoys playing golf and is a member of the Muthaiga Golf Club. He is a practicing and a very committed member of the Roman Catholic Church and attends Consolata Shrines Catholic Church in Nairobi every Sunday at noon. On 21 August 2016, Kibaki, who was ill, was taken to Karen Hospital and later flown to South Africa for specialized treatment. Kenya Doctor of Science ? ^ Encyclopædia Britannica. "Mwai Kibaki". Encyclopædia Britannica. Retrieved 19 August 2012. ^ Beresford, David (31 December 2007). "Baptized record". The Guardian. London. Retrieved 7 June 2009. ^ a b c d "State House profile". Statehousekenya.go.ke. Archived from the original on 11 June 2009. Retrieved 7 June 2009. ^ "Eye on Kenyan Parliament". mzalendo. Archived from the original on 8 May 2008. Retrieved 7 June 2009. ^ "Mwai Kibaki: Biography from". Answers.com. Retrieved 1 June 2010. ^ Smith, Russell (29 December 2002). "Profile – Kenya's New Leader," BBC News Online". BBC News. Retrieved 1 June 2010. ^ Rice, Xan (3 February 2008). "Wave of anarchy blamed on Kenya's 'General Coward'". The Guardian. London. Retrieved 19 May 2010. ^ a b "Columbia Encyclopedia: Mwai Kibaki". Answers.com. Retrieved 1 June 2010. ^ a b Walsh, Declan (4 January 2003). "Nairobi's corruption busting new leader tries to undo Moi's years of misrule". The Independent. London. Archived from the original on 14 May 2013. Retrieved 19 May 2010. ^ "AFRICAN ELECTIONS DATABASE-Elections in Kenya". Africanelections.tripod.com. Retrieved 1 June 2010. ^ "The deal and deal makers in Kibaki's 2002 victory". Nation.co.ke. Retrieved 1 June 2010. ^ a b "Kenyan candidate treated in London". BBC News. 5 December 2002. Retrieved 1 June 2010. ^ "Ref Elections in Kenya". Psephos.adam-carr.net. Retrieved 1 June 2010. ^ "EMILIO MWAI KIBAKI 1. ENCYCLOPEDIA – COLUMBIA UNIVERSITY PRESS 2. BIOGRAPHY" (PDF). Google. Retrieved 7 June 2009. ^ a b c d Gitau Warigi (14 April 2006). "Kibaki's 'mafia' on the run". BBC News. Retrieved 1 June 2010. ^ a b Walsh, Declan (30 December 2002). "New era for Kenya as opposition obliterates ruling party". The Independent. London. Retrieved 19 May 2010. ^ Bernard Namunane and David Mugonyi (17 February 2009). "Chaos in cabinet as Karua and Ruto clash". Daily Nation. Retrieved 1 June 2010. ^ a b "It's a mixed bag of fortunes as Kibaki heads off to retirement - Daily Nation". nation.co.ke. Retrieved 28 July 2016. ^ a b "Kibaki's failing health put on hold all pledges he had made". Daily Nation. Retrieved 1 June 2010. ^ "Assertive Kibaki suprises [sic] Kenyans". The Nairobi Chronicle. 23 March 2009. Retrieved 1 June 2010. ^ "Kenya's vice-president dies". BBC News. 23 August 2003. Retrieved 1 June 2010. ^ "Kenya: Free primary education brings over 1 million into school". UN Children's Fund. ReliefWeb. Retrieved 16 October 2012. ^ "Clinton Visits Kenya". CBS News. 22 July 2005. Retrieved 16 October 2012. ^ Education Next, Fall 2005: "Private schools for the poor: education where no one expects it"
^ "Analysis by Wanjohi Kabukuru". Thefreelibrary.com. Retrieved 1 June 2010. ^ "Kenya's entire cabinet dismissed" Archived 6 March 2016 at the Wayback Machine, BBC News, 23 November 2005. ^ "Kenyan president announces new party affiliation for re-election bid" Archived 19 January 2008 at the Wayback Machine, Associated Press (International Herald Tribune), 16 September 2007. ^ a b "Kenya president eyes re-election" Archived 21 March 2016 at the Wayback Machine, BBC News, 16 September 2007. ^ ""Kibaki: I deserve another term"". Archived from the original on 5 March 2008. Retrieved 5 March 2008. CS1 maint: BOT: original-url status unknown (link), AFP via News24.com, 30 September 2007. ^ "Too Close to Call: Why Kibaki Might Lose the 2007 Kenyan Election". Center for Strategic and International Studies. Archived from the original on 3 September 2009. Retrieved 1 June 2010. ^ "A Thomson Reuters Foundation Service". AlertNet. 6 November 2011. Retrieved 19 November 2011. ^ Rice, Xan (31 December 2007). "Kenyans riot as Kibaki declared poll winner". The Guardian. London. Retrieved 19 May 2010. ^ "Inside Kenya's elections 2008". Africa Confidential. Retrieved 1 June 2010. ^ "BBC:Kibaki named victor in Kenya vote". BBC News. 30 December 2007. Retrieved 1 June 2010. ^ "Kibaki re-elected Kenyan president: official results" Archived 23 August 2009 at the Wayback Machine, AFP (abc.net.au), 31 December 2007. ^ "Kibaki named victor in Kenya vote" Archived 4 June 2016 at the Wayback Machine, BBC News, 20 December 2007. ^ "Kibaki claims win in disputed Kenyan election". Mcclatchy. 30 December 2007. Archived from the original on 7 March 2008. Retrieved 1 June 2010. ^ "Raila 2007 – Welcome". Raila07.com. Retrieved 1 June 2010. ^ Rice, Xan (27 December 2007). "Kenya deaths and accusations on eve of polls". The Guardian. London. Retrieved 19 May 2010. ^ "Microsoft PowerPoint – 2008 August 14 Kenyan Election Day Poll December 27, 2007 [Compatibility Mode]" (PDF). Interinational Republican Institute. Archived from the original (PDF) on 25 March 2009. Retrieved 1 June 2010. ^ a b "Kenya's Post-Election Violence". The Tokyo Foundation. Retrieved 1 June 2010. ^ a b "The Kenya Election Violence Explained". Kenya-advisor.com. 27 December 2007. Retrieved 1 June 2010. ^ "Office of Government Spokesperson – Election 2007 – KENYA President". Communication.go.ke. Archived from the original on 1 May 2010. Retrieved 1 June 2010. ^ "Global Insight // Same-Day Analysis". Globalinsight.com. Retrieved 1 June 2010. ^ Xan Rice in Nairobi (31 December 2007). "Kenyans riot as Kibaki declared poll winner". The Guardian. London. Retrieved 1 June 2010. ^ Wangui Kanina and Duncan Miriri (9 January 2008). "Reuters". Uk.reuters.com. Retrieved 1 June 2010. ^ Published: 10:01 pm Monday 31 December 2007 (31 December 2007). "Protests, deaths in Kenya after disputed election | WORLD News". Tvnz.co.nz. Archived from the original on 13 June 2011. Retrieved 1 June 2010. ^ "Violence ensues as Kibaki reelected". France 24. 30 December 2007. Archived from the original on 23 August 2009. Retrieved 1 June 2010. ^ "Tribal Politics by Stanley Meisler". Stanleymeisler.com. Retrieved 1 June 2010. ^ "ReliefWeb ť Document ť Tribal rivalries underlie Kenya post-election violence". Reliefweb.int. 31 December 2007. Retrieved 1 June 2010. ^ "African Union head meets Kenya's feuding parties". Christiantoday.com. 10 January 2008. Retrieved 1 June 2010. ^ "Odinga Sworn in as Kenyan Premier" "Archived copy". Archived from the original on 17 September 2016. Retrieved 2009-06-08. CS1 maint: Archived copy as title (link)-accessed 8 June 2009. ^ Phombeah, Gray (5 August 2002). "BBC:Moi's legacy to Kenya". BBC News. Retrieved 1 June 2010. ^ "Kenya - GDP - real growth rate - Historical Data Graphs per Year". indexmundi.com. Retrieved 28 July 2016. ^ "Major Projects in Northern Kenya". Railwaysafrica.com. 4 June 2009. Archived from the original on 21 June 2009. Retrieved 1 June 2010. ^ Ali Abdi (4 July 2007). "Major transport project to open up northern Kenya". Eastandard.net. Archived from the original on 8 June 2009. Retrieved 1 June 2010. ^ a b "The Kenya Government – Achievements of the 2002–2007 Government of Kenya". Kenya-information-guide.com. Retrieved 1 June 2010. ^ "What has Kibaki Government done with your Money? Truth be Told". Communication.go.ke. Archived from the original on 13 December 2010. Retrieved 1 June 2010. ^ "Kibaki's Achievements on the Infrastructure". SkyNewswire.com. Archived from the original on 5 October 2011. Retrieved 1 June 2010. ^ "CDF was focus of Uhuru's stimulus plan". The Standard. 12 June 2009. Retrieved 1 June 2010. ^ "Constituency Development Fund". Kippra.org. 9 January 2004. Archived from the original on 17 February 2010. Retrieved 1 June 2010. ^ "New source of funding for Kenya's rural projects". Entrepreneur.com. Archived from the original on 29 August 2008. Retrieved 1 June 2010. ^ "Office of Public Communications – Office of Government Spokesperson". Communication.go.ke. Archived from the original on 22 November 2010. Retrieved 1 June 2010. ^ "The unveiling of Kenya Vision 2030". Planning.go.ke. 15 September 2009. Archived from the original on 20 August 2009. Retrieved 25 June 2010. ^ "China Confidential: China Closes Oil Exploration Deal in Kenya". Chinaconfidential.blogspot.com. 28 April 2006. Retrieved 1 June 2010. ^ "Kenyan President thanks Chinese government for support". Fmprc.gov.cn. 26 February 2005. Retrieved 1 June 2010. ^ english@peopledaily.com.cn (25 February 2009). "Iran extends credit facility to Kenya – People's Daily Online". People's Daily. Retrieved 1 June 2010. ^ "Office of Public Communications – Office of Government Spokesperson". Communication.go.ke. Archived from the original on 20 September 2010. Retrieved 1 June 2010. ^ "China building solid road to Kenya relations". News.xinhuanet.com. 11 October 2007. Archived from the original on 3 January 2011. Retrieved 1 June 2010. 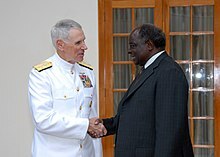 ^ Mwakugu, Noel (21 January 2008). "Kenya's 'mafia' feel the heat". BBC News. Retrieved 19 May 2010. ^ "Ethnicity and Violence in the 2007 Elections in Kenya" (PDF). Afrobarometer Briefing Paper No. 48. February 2008. Archived from the original (PDF) on 9 May 2008. Retrieved 19 November 2011. ^ Mwakugu, Noel (21 January 2008). "Kenya's 'mafia' feel the heat". BBC News. Retrieved 1 June 2010. ^ a b "KEGORO: Will the roads and economy define Kibaki's legacy or the lost chances? - Daily Nation". web.archive.org. Archived from the original on 13 April 2013. Retrieved 28 July 2016. ^ "Kibaki, giant of Kenyan politics, wins last fight". Alertnet.org. 30 December 2007. Retrieved 1 June 2010. ^ Matthew Tostevin (12 February 2009). "Business Books: Corruption drains Kenya as donors turn blind eye". Reuters. Retrieved 1 June 2010. ^ LYNN SWEET Sun-Times Columnist (29 August 2006). "Senator Obama Rebukes Kenya Corruption". Chicago Sun-Times. Archived from the original on 4 October 2009. Retrieved 1 June 2010. ^ "End of a decade of highs and lows for Mwai Kibaki - Daily Nation". nation.co.ke. Retrieved 28 July 2016. ^ Agutu, Nancy (26 April 2016). "Former First Lady Lucy Kibaki is dead". The Star. ^ "Official profile". Statehousekenya.go.ke. Archived from the original on 6 April 2010. Retrieved 1 June 2010. ^ "Kibaki: I have only one wife". YouTube. Retrieved 1 June 2010. ^ "Wambui trounces Kibaki's chosen Othaya heir - Capital News". capitalfm.co.ke. Retrieved 28 July 2016. ^ "Jeff Koinange Live: Tony Gachoka meets Bonny Khalwale where they make stunning revelations". Jeff Koinange Live. 3 December 2015. Retrieved 30 June 2015. ^ "Honorary Degrees". University of Nairobi. Retrieved 12 November 2014. 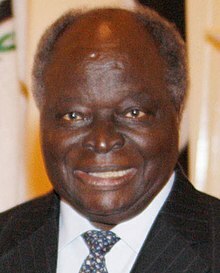 ^ "Profile: Kibaki" (PDF). politicalarticles.net. Retrieved 12 November 2014. ^ "President honoured by Masinde University". capitalfm.co.ke. 4 July 2008. Retrieved 12 November 2014. ^ "Citation" (PDF). University of Nairobi. Retrieved 12 November 2014. ^ "KU Honours President Kibaki" (PDF). Kenyatta University. 19 July 2010. Retrieved 12 November 2014. ^ "PRESS RELEASE: UNIVERSITY COUNCIL ENDORSES HONORARY DOCTORATE FOR H.E. 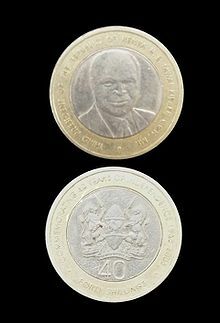 MWAI KIBAKI". Makerere University. 2012. Retrieved 12 November 2014. ^ "Kibaki receives Honorary Doctorate Degree". news24.com. 2013. Retrieved 12 November 2014.